“It broke my heart going back to work and leaving my tiny child at the end of my maternity leave, but I felt worse when one day I got a call to come back home quickly because my baby was having difficulty breathing, a condition I was told is called Apnea,” narrates first-time mother, Iman Khatib. In a country where over 200,000 babies are born premature and over 11,000 of them die from preterm birth complications, life-saving campaigns like those organised by Doris Mollel, a former beauty queen who was born prematurely herself, are to be supported and applauded. 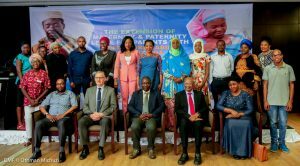 Through her organisation, the Doris Mollel Foundation (DMF), a panel discussion was organised last Saturday in Dar es Salaam, where testimonies from parents of premature babies, medical workers and adults who were born prematurely met to discuss and urge the government to extend paternity and maternity leave for parents of premature babies. It is said that ‘everyone has a story’ and many stories were told during the event. Panel discussion underway, from left: Chiku Lweno (at the podium), Innocent Mungy, Alvaro Rodriguez, Dr. Ahmadi Makuwani, Dr. Augustine Massawe, Sizya Puya. At the event, the Minister of Health, Community Development, Gender, Women, Elderly and Children was represented by Dr Ahmadi Makuwani who is the Director of the Reproductive, Child Health Services. Dr Makuwani said that he noted concerns raised by the participants, representing civil society, businesses, United Nations, media and individual parents and children who were born before the full term in the womb. Participants unanimously suggested an extension of maternity leave for mothers of premature babies from the current 3 months to 6 months. They also suggested an extension of paternity leave from 3 days to 1 month. In this week leading up to the Day of the African Child on June 16, protecting the lives of premature babies has been given priority even in the Parliament of Tanzania where debates on promoting the increase of parental time with the babies have taken place. 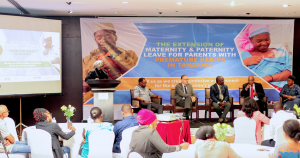 It makes sense economically, socially, and in terms of health and survival as Tanzania joins the international community led by the United Nations to ‘leave no one behind’ especially noting that 1 in every 9 babies in Tanzania are born prematurely. At Children in Crossfire we strive to contribute to creating a compassionate world where every child can reach his or her full potential, so we are therefore delighted to support this campaign for the benefit of pre-term born babies. Happy Day of the African Child!